Now on Amazon: Bring Your Superpowers to Work! 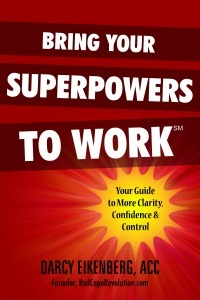 My book, “Bring Your Superpowers to Work: Your Guide to More Clarity, Confidence & Control,” is now available on Amazon.com! my coaching, consulting, and speaking who want to find a new way of working in the new world of work. To counter the negativity and hopelessness that’s becoming too quickly accepted as the norm within corporate life today. To give you simple, practical tools and encouragement that you can discover your clarity, build your confidence, and take control over your worklife, no matter where you work and what you do. I really, really, really hope you enjoy the book. To get you started, you can download the introduction and Part 1 here (available also on audio). Of course, I’d like you to consider purchasing the entire book, too! So when you buy it during our first few months, I have a few other gifts to say thanks. Buy 10, and we’ll schedule a private hour-long coaching meeting with you or someone you choose, to tackle your most important career or workplace issue. Buy 25, and we’ll schedule a package of three private coaching sessions for you or a friend. Buy 50 or more, and I’ll visit your location for a day in 2012 (anywhere in the world, at my expense) and work in-person with your company, team or just with you! It’s my way to express my appreciation and thanks! To get your bonus, email your Amazon receipt to book@RedCapeRevolution.com! We’ll send you information on your gift, and also send our thanks!! Thank you to all of you who’ve helped me bring my superpowers to work. can’t wait to share this book with you and the important people in your work and life!